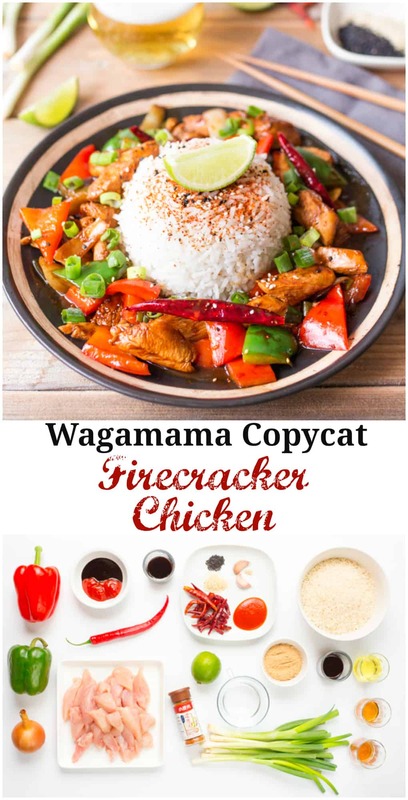 If you love Wagamama’s Firecracker chicken. 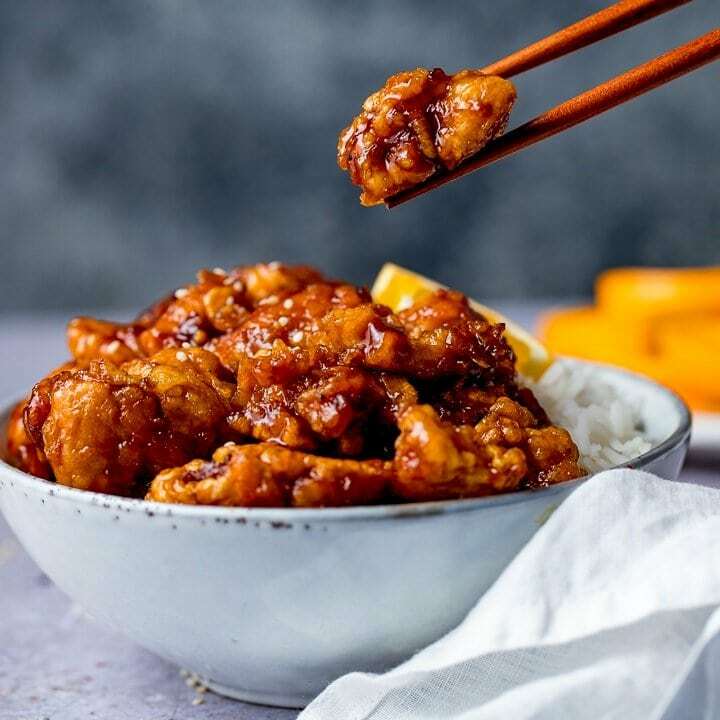 This is my Copycat version of Wagamama’s sweet and spicy Firecracker Chicken. 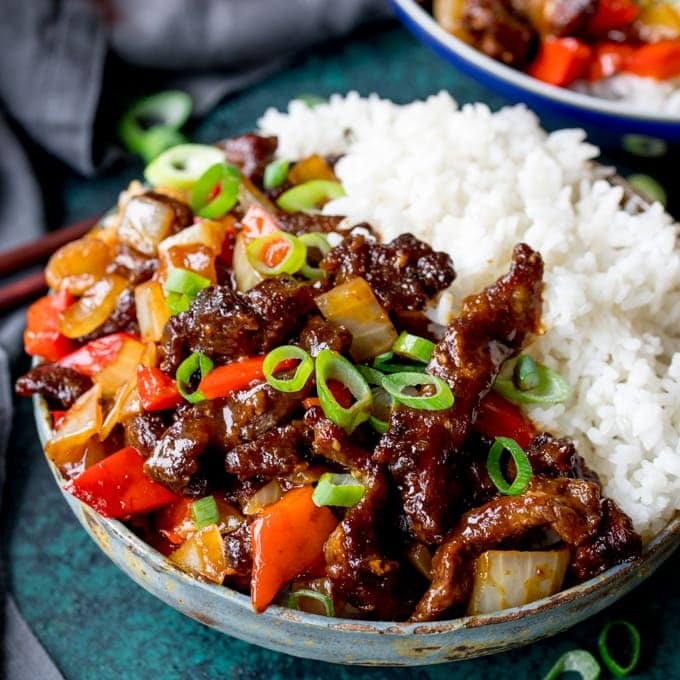 Its delicious and easier to make than you might think! 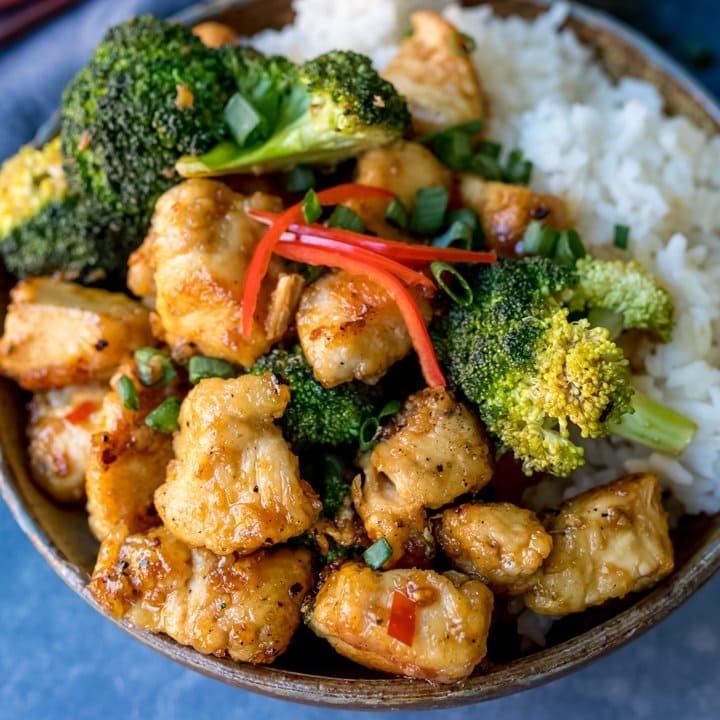 Wagamama’s Firecracker Chicken, Have you tried it? Chances are, if you’re outside of the UK or the Boston area then you probably be haven’t. Which is a sad, sad thing, because this meal is soooo good. The recipe is a closely guarded secret, and I’d love to tell you that I managed to steal the secret formula SpongeBob style. But I didn’t. You’ll notice I left out the mangetout/snow peas. I think my kids grabbed them from the fridge for a snack – which I really can’t complain about. Large bowl for marinating the chicken. 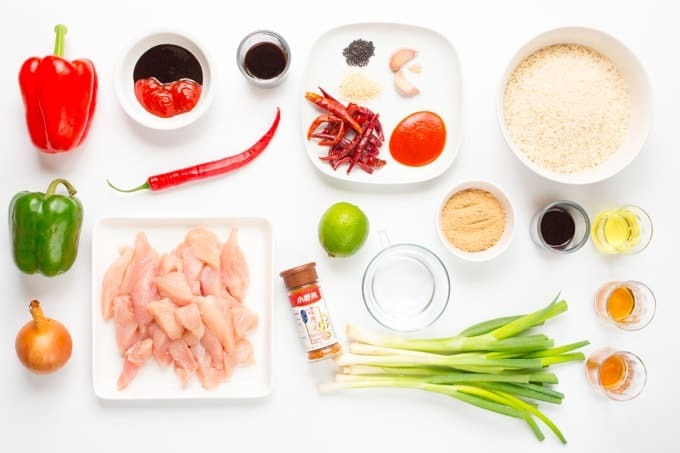 Place all of the marinade ingredients into a large bowl and mix together. Add the chicken, then cover with cling film and marinade for at least an hour (or up to overnight). Cook your rice as per pack instructions. Whilst the rice is cooking, heat the oil on a high heat in a wok or large frying pan/skillet until hot. Scoop the chicken out of the marinade with a slotted spoon and cook in the wok until slightly browned, and almost cooked right through. Add in the chopped onion and cook for a further 2 minutes to soften the onion slightly. Add in the marinade and heat through whilst stirring until bubbling throughout. It's important to ensure all of the sauce has been completely cooked through, as it's had the raw chicken in it. Add in the peppers, mangetout/snow peas and dried chillies. Cook for a minute, then stir through the spring onions/scallions. Add a splash of water to the sauce if it needs loosening up. Check one of the larger pieces of chicken to ensure it’s cooked in the middle. Then turn off the heat. Take your boiled rice and spoon it into a small bowl. Push it down with the back of a spoon, then place a serving plate on top and turn the whole thing over. Tap the bowl to release the mound of rice. Repeat until you have four plates of rice. 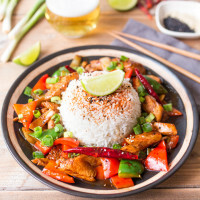 Spoon the firecracker chicken around the rice and then sprinkle the top of the rice with the shichimi powder and the sesame seeds. Top the rice with a wedge of lime and serve! 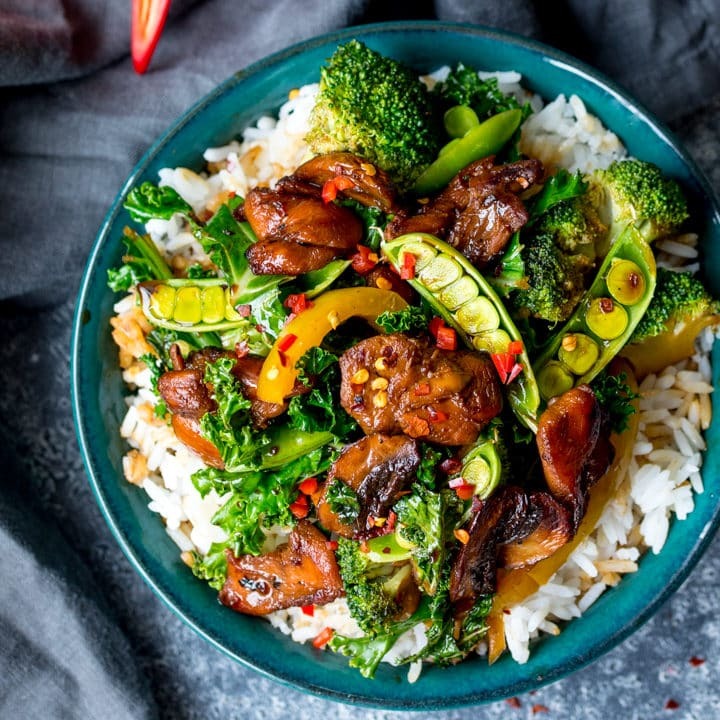 Nutrition info is for one serving of this recipe and does not include rice. 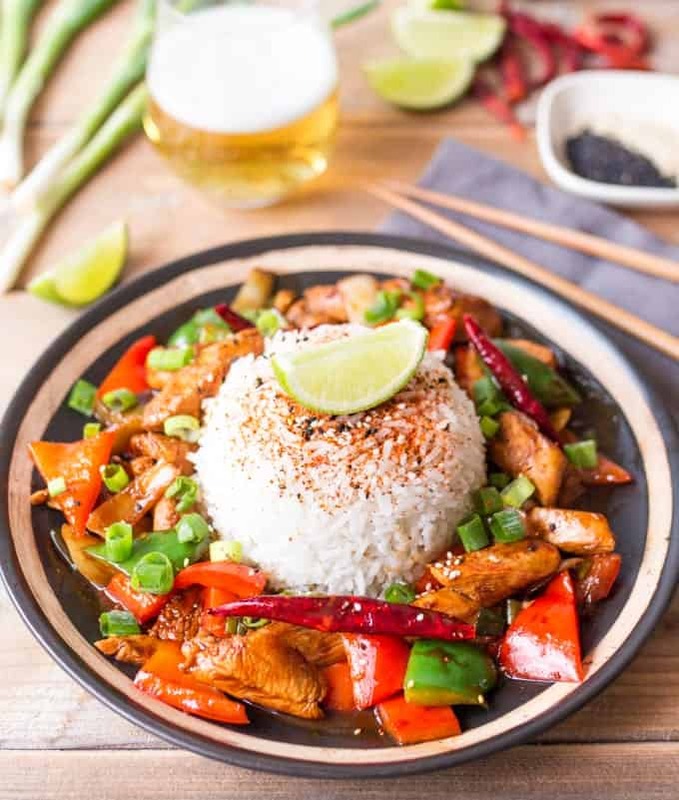 I made this and it was just as good as Wagamamas was very nice and very easy to follow the instructions the wife loved it, it was really easy to make, I didnt have the Arbol chillies or shichimi powder but it was still great, its now on our weekly meal plan. Love it. Made it on Valentines for me and the wife, we both absolutely loved it! Can you freeze it If made extra portions? Hi Lucy, I haven’t tried freezing this, but I think it should freeze ok. You will probably need to reheat (until the chicken is piping hot in the middle) in a pan to thicken the sauce again, as it may thin out when frozen. I’d also thrown in some fresh veg when reheating too. I sadly never took the sauce recipe before I left but this look pretty like the real deal!